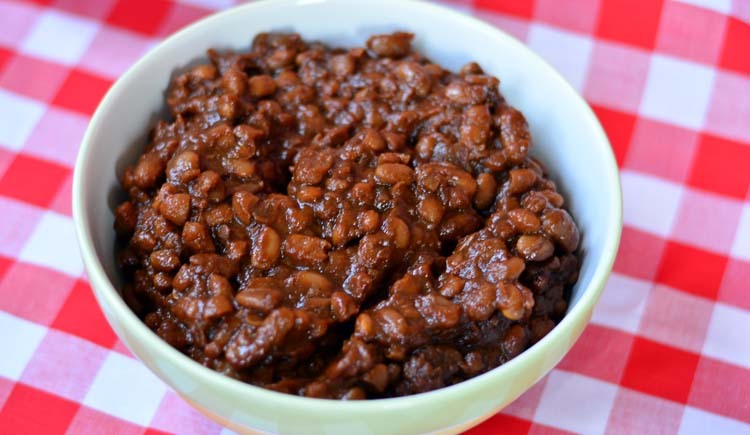 Baked beans are a quintessential American food and a favorite summer side dish at picnics and potlucks! 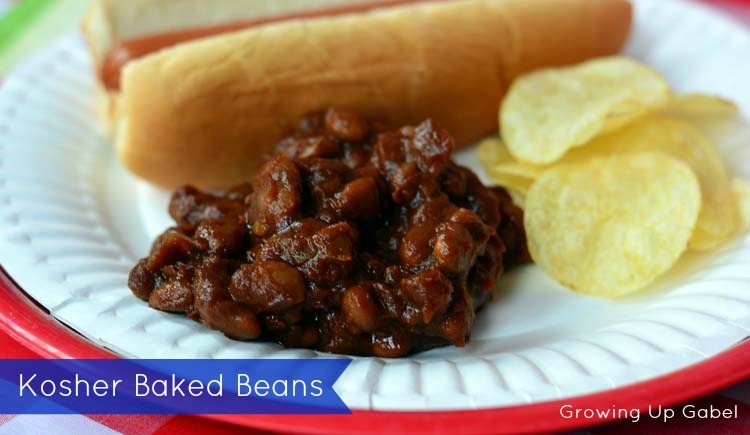 This baked bean recipe cooks all day in the slow cooker leaving you free to enjoy the weather. 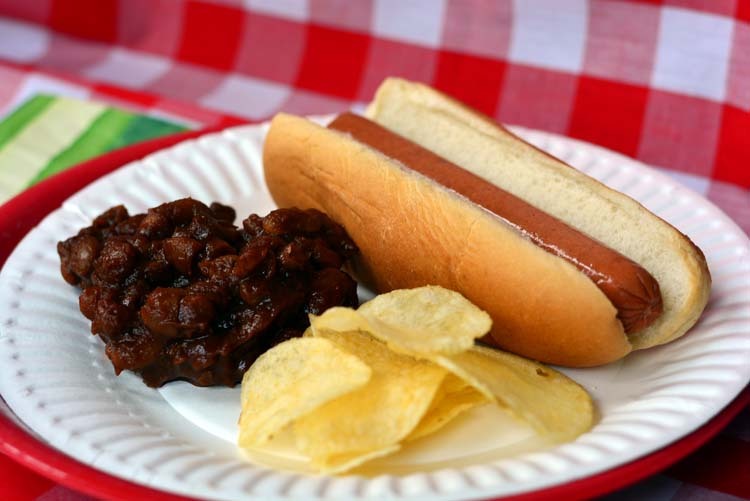 This kosher recipe makes the baked beans perfect for enjoying with Hebrew National's all-beef kosher hot dogs all summer long. It's official – summer has begun! For many of you, the kids are home for the summer already. Our school doesn't end for another week or so but that didn't stop us from enjoying the first long weekend of the summer – Memorial Day Weekend. We had a fun filled weekend and I'm always amazed at what we can fit in to that one extra day. If you follow me on Instagram you saw photos from our long weekend like the one above. I started my summer preserving this weekend with a batch of strawberry freezer jam. 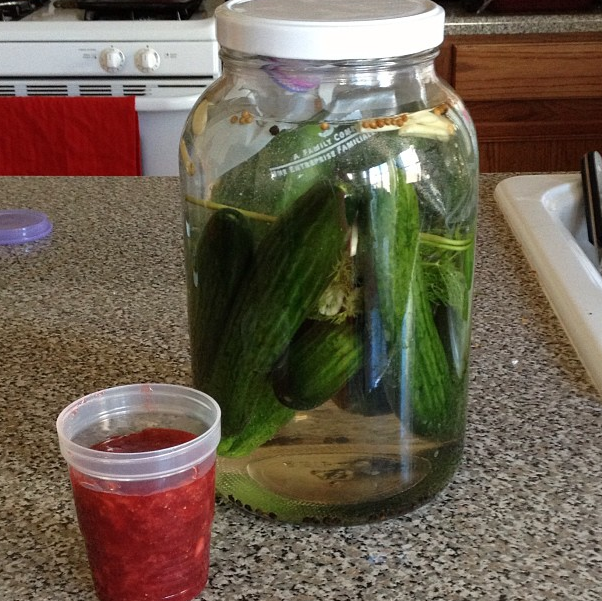 I also started fermenting my first batch of full sour pickles, which are my husband's favorite treat. 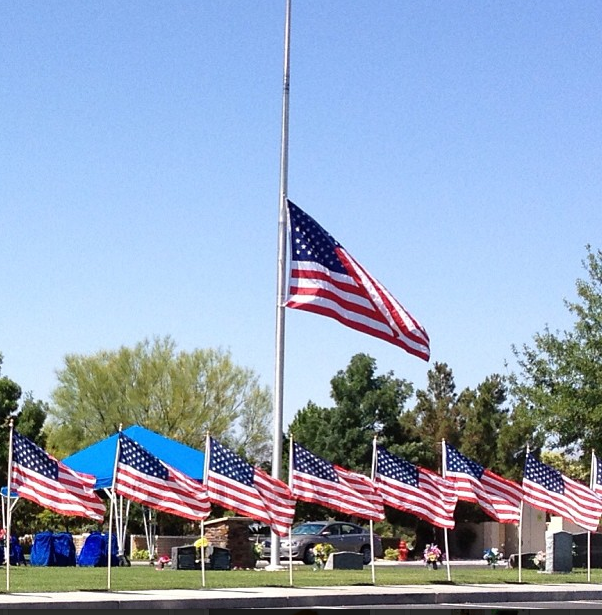 On Monday morning I went to our local cemetery to pay tribute to the men and women who died for the freedoms I enjoy every day. And it wouldn't be summer without hot dogs! We ventured to the grocery store, which was surprisingly not busy, to stock up on our favorite brand of hot dogs – Hebrew National. Now, I grew up eating regular old pork hot dogs and frankly, not being too impressed with them. Hot dogs were not my favorite meal. Then I got married to a man who was raised in New York. New Yorkers take their hot dogs very seriously! I had no idea there was even a difference in hot dogs until we got hitched. But there is a huge taste difference in all beef hot dogs and Hebrew National is my husband's favorite brand. 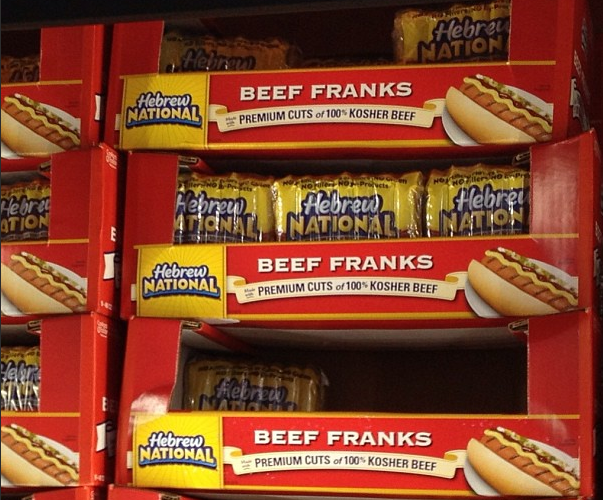 Hebrew National is seriously the only brand of hot dogs we now buy. I went from barely tolerating hot dogs to actually planning meals around them. For our Memorial Day get together I wanted to make another all-American side dish to go along with our all-American kosher all beef Hebrew National hot dogs. I had tried making baked beans from scratch once before and the result was less than stellar. This time I did some serious research, kept a close eye on the slow cooker and the resulting beans were spot on delicious. In keeping with the spirit of Hebrew National's kosher hot dogs, these baked beans are also kosher. Don't let the lack of bacon fool you – I promise you won't even notice it's not in there. I would suggest making the beans at least a day ahead of time to give the flavors time to meld and mellow before serving. You could also cut up the hot dogs and mix them right in to the baked beans and serve as a fun dish. Sort through beans and discard any stones or bad beans. Place in a large bowl and cover with water. Soak overnight. Drain beans from water and place in a 4 quart slow cooker. Add diced onion on top of beans. In a small bowl combine 1 cup water with brown sugar, maple syrup, molasses, vinegar, mustard, pepper, nutmeg, cinnamon and liquid smoke. Pour mixture over beans in slow cooker. Add an additional 2-3 cups of water so that the beans are completely covered by liquid. Stir to combine. Cook on low for 8-12 hours adding more water if needed. Once beans have reached desired consistency, stir in salt. Serve immediately or refrigerate until ready to serve and re-heat. Hebrew National tastes great because, for more than 100 years, we've adhered to the highest quality standards. Hebrew National Franks are made with premium cuts of 100% pure kosher beef, and contain no artificial flavors, no artificial colors, no by-products, and no fillers. Premium taste and high quality every time, for any occasion. That's our guarantee. Learn about even more reasons to love Hebrew National, and tell us why you love them, too! http://www.facebook.com/HebrewNational! This recipe sound great but instead of make it for 8 peoples I am going to divided and make it just half of it. Is that sound good? I have never done that, but it should be fine! Those baked beans look delicious!! Thank you, Camille for the bean recipe. Sounds really nice and I’ll be trying it soon. Have a great weekend!